This is the journal entry for my quiet time with God this morning. See here on how I approach my daily quiet time. These words are part of Jesus’ farewell discourse in John’s gospel. Jesus tells His Church that our command is to love each other as Christ has loved us. And how did and does Jesus Christ love us? He gave up on the easy path in order to follow the hard path for our sakes. He died to Himself in order to liberate us and claim new, everlasting lives for all who believe in Him. This is how Christians are called to love each other: to willingly give up our lives for the sake of others’ eternal salvation. This isn’t to say that our lives can redeem sinners; Christ’s death alone accomplishes this. But Christians are called to so die to self--our desires, our preferences, our orientations to our own individual inborn preferred sins, our own advantages or comforts--for the sake of others’ salvation. A neighbor of my brother lived this call out in a truly heroic way. The neighbor was gay and he worked daily on an AIDs hotline. He also was celibate, explaining to my brother, that he knew it was God’s will that sexual intimacy be confined to marriages between women and men. That man died to himself in order to follow Christ and to help others know life with Christ. And this is exactly where the commands and laws of God leave us: They point us to the right and show us that we are incapable of doing it. Through faith, inspired and maintained by God through our daily repentance and renewal, Christ’s obedience works righteousness in us, declaring us righteous for the sake of what Jesus accomplished on the cross and making us righteous--sanctifying us--by the power of the Holy Spirit working in those whose belief causes them to daily surrender self again and again. God truly treats repentant believers with amazing grace! And I am thankful! Listen: But I must not fail to hear God’s law. I must hear it, not because it can save me, but because it’s God’s declaration of His will and because it’s so easy, in the rush of everyday events, for me to wander away from Christ (like a lost sheep) and try to live life in my own power. Jesus’ command that I love others in the same self-sacrificing and self-denying way raises the question in me: Do I love others in the way Christ loves me? The answer, of course, is no...and not just because I haven’t given up my physical life for another’s salvation. This leads to another question: In practical terms, how can I die to self in order to help others to know Jesus and have life in His name? What am I willing to sacrifice in order to help others have salvation in Christ? And there’s another question: What sins have I indulged in my own life that have led others not to Christ, but to sin, because I was looking out for my desires rather than dying to myself? All of this can be distilled to a single question, really: What do I love more: The God known in Christ, my fellow disciples, and other people or my sins? Because Christ loves me, died for me, rose for me, and saved a place for me in eternity (John 14:2-3), I am set free to live with the same selflessness with which Christ lived and still lives. Respond: Father, help me to discern practical ways in which I can love others as Christ loves me, including ways to avoid leading people away from you. 1. Let my ears, in Luther’s phrase, be a tomb to gossip. 2. Help me to live modestly, including refraining from the overconsumption of food and of food not good for me, a sin to which I am prone. Overindulgence in food is a sure sign of being tied more to the world and the gratification of desires more than I am to Christ. (Philippians 3:19) I really need to attend to this, Lord. I pray Your Holy Spirit's help in doing so. 3. Grant that my conversations will only honor You. I don’t mean that I should spout religious cliches in my interactions with others; that wouldn’t honor You. Help me to remember what Paul says in Ephesians 4:29 and 1 Thessalonians 5:11. 4. Help me to look for ways to be helpful to others, to not be so caught up in my “to do list” that I don’t have time for others. Reformation Sunday is one of my favorite days on the Church calendar. And this year, of course, brings a special celebration of this day with the 500th. 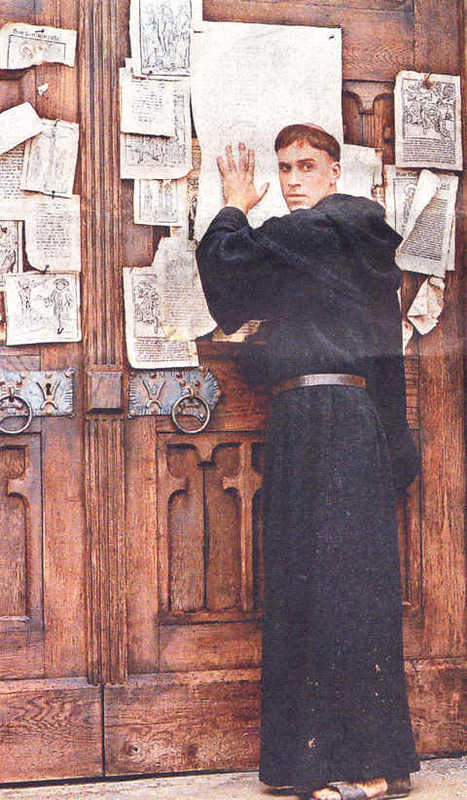 anniversary of Martin Luther posting his 95 Theses on the Wittenberg church door. But there’s a bit of danger in all this celebrating of our Lutheran heritage. It can too easily become about Luther and our connection to him. But Reformation Sunday isn’t a time to say, “Yay, us!” It’s a call to thanksgiving that we are only saved from sin and death by the power of God’s grace given to those who trust in the Word made flesh, Jesus Christ, as their God, Savior, and King. It’s a truth of which we in the Church and the world we seek to reach in Christ’s names need to always be reminded! That's because, as long as we're on this earth, you and I will need to be open to the reformation of our faith, lives, and characters that God wants to accomplish in us. While we can be thankful that God used Luther to re-awaken the Christian Church to the true teachings of God in His Word, Reformation Sunday calls us to live in the light of two fundamental truths. The second truth is that Jesus Christ, God enfleshed and sinless, took the punishment of death I deserve for my sin on the cross, then was raised by God the Father, so all who turn from sin and follow Him are freed of sin and death and have eternal life with God. I need saving and I can’t save myself: I can’t be good enough, sorry enough, or virtuous enough to be saved. Only Jesus Christ can save me. All of this leads to today’s gospel lesson. It records an encounter between Jesus and fellow Jews who believed in Him. In it, Jesus talks about what it means to be saved, what it means to be His disciple. And, because the New International Version translation of the Bible, which is the version we have in our sanctuary and which I usually use in preaching, is so horrible in translating the first verse of today’s gospel lesson, I’m going to be using the more accurate English Standard Version today. So, up here on the screens, take a look at our gospel lesson, please, John 8:31-36. There may not be two more important verses in all of Scripture than these! That’s true because, first of all, Jesus here defines what belief or faith is. 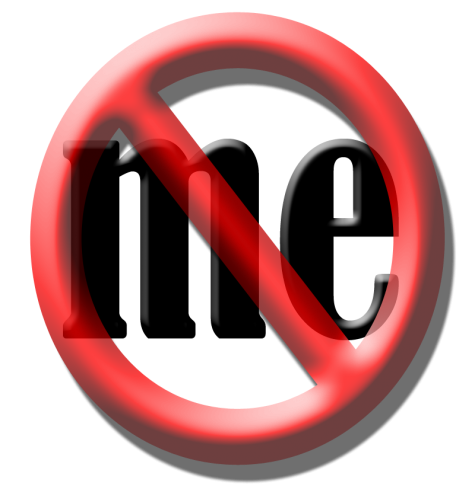 The word translated as abide is, in John’s Greek, μείνητε, a verb, an action word meaning to remain, stay, stick it out. The people to whom Jesus first addressed these words believed that Jesus was something special; after all, they were part of the crowd of 5000 Jesus had fed with a few fish and pieces of bread. Their opinion was basically, “Jesus is a great dude.” But Jesus says that faith is not a personal opinion. Faith is abiding, standing fast, when the crosses come, the chips are down, the temptations are great. This verse is also important because Jesus tells us what to abide in. Or more accurately, who we are to abide in. Jesus says we’re to abide in His Word. Jesus means more than spending time in this book, the Bible, the Word of God. That book, the Bible, is worthy of spending our time in it not just because it contains the Word of God. It's worthy because it tells us about the Word of God. John 1 tells us: “In the beginning was the Word, and the Word was with God, and the Word was God.” (John 1:1) And then, “The Word became flesh and made his dwelling among us.” (John 1:14) Faith is making our home on the strong foundation of Jesus, the Word of God, and staying there! 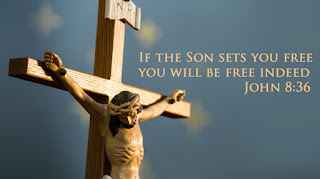 Jesus says when we do this, we will be free. People who are enslaved are often quick to deny their slavery. Someone tells a friend, “I think you have a drinking problem,” and the friend denies their addiction. Today, Jesus calls us to look at ourselves as we appear in the eyes of God. What enslaves us? Indifference to God and the hurting people around us? These and every other sin stemming from our failure to remain rooted in the God we know in Jesus are what enslaves people, taking them away from God and the life that only God can give. Christ wants us to see the truth. And just as the Word is a person, Jesus Himself, so is the truth. Jesus says, “I am the way and the truth and the life. No one comes to the Father except through me” (John 14:6). When we remain rooted in Christ, we see in the brilliance of God’s truth what enslaves us and we see too, that we can trust in the love and power of our crucified and risen Jesus to set us free to live, now and in eternity. That woman was enslaved to her sin, enslaved to the idea that she needed this man to verify her worthiness as a human being. She understood that it was wrong, that her eternal destiny hung in the balance. But she was helpless to overcome her sin. And here’s the thing: We are all helpless to resist sin when we try to do our own. When God helps us to first, see our sins, and then, see the grace He offers in Christ, we are ready to be set free...not by our efforts to be good or religious or strong, but by Jesus Christ, Who died and rose for helpless sinners like you and me. It is only when we know our helplessness and Who is the only One Who can help us that we will ever be free. When I empty myself of all pretense of having it together, of being a good person, of being proud of my humility, it’s then that the God we meet in Jesus can fill us with God’s strength, God’s goodness, God’s love, God’s righteousness. In other words, it’s only when we stop denying that we are sinners that we are open to the truth embodied in Jesus that we are “saved by grace through faith in Christ” alone! An old saying puts it this way: When I’m at the end of me and God is all I’ve got, I realize that God is all I need! I don’t always experience the fullness of God’s grace as God intends to give it to believers. I too often get in the way. But there are times when I do get out of the way. This past week, I went to the deli again. Driving there, I asked, “Why do I almost always go to this deil? There’s another one closer.” “Just go,” I sensed God say. When I got there, two different employees, neither one of them waiting on me, approached me about situations in their lives. In that moment, Christ set me free from myself! Instead of denying our slavery to sin, you and I need to confess it, so that Jesus Christ can set us free. Not just once in a lifetime. Not just once a week. Not just at church. Not just at the deli. Always! We need to remain in Christ so that we’re free to live. When Martin Luther, after steeping Himself in Scripture, came to see that God sets free all who repent and believe in Jesus Christ, he understood that sin and death need not be the last words for human beings. Even sinners like Martin Luther, Mark Daniels, you, and every human being, can be set free to live as God intended for us to live: His grateful, grown-up children, filled with the life and power of God, at ease in knowing that God will guide us through every moment in this fallen world, certain that we will live with God forever. Even now, through Christ and our faith in Him, we are free. And that is what we can celebrate on this Reformation Sunday!